미 야후 뉴스, 특검의 박 대통령 심문과 청와대 조사 임박 - Newspro Inc.
미 야후 뉴스는 25일 AP 통신을 받아 박근혜의 측근으로서 국정을 농단하여 수감된 최순실이 특검 사무실에 도착 후 기자들을 향해 수사가 불공정했으며 박근혜와의 관계에 대해 사실이 아닌 것들을 고백하도록 강요받았다고 소리를 질렀는데, 이는 흔치 않은 장면이라고 보도했다. 특검의 이규철 대변인은 2월 초 거대한 부패 스캔들을 조사하기 위해 박근혜와 청와대 조사를 추진하고 있다고 말했다. 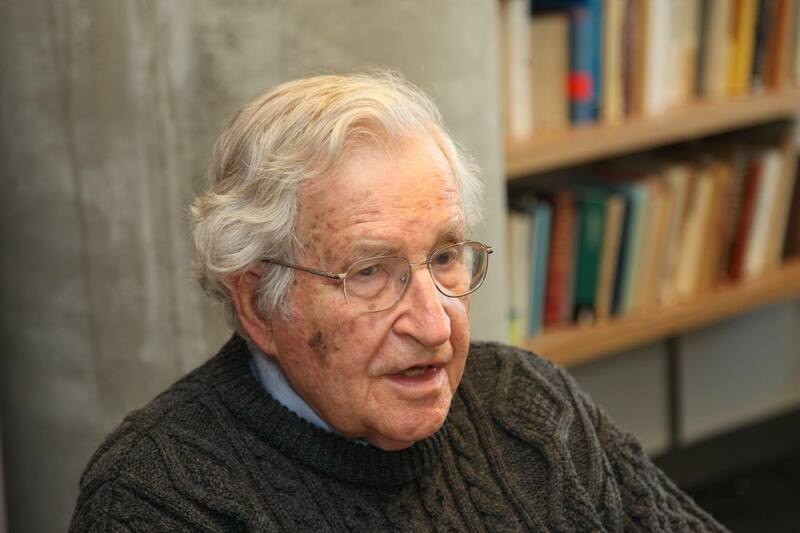 권한을 박탈당했지만 직을 유지하고 있는 박근혜가 특검의 심문에 응하겠다고 했지만 청와대 수사를 허용할지는 분명하지 않다고 보도했다. 박근혜는 최 씨가 국정을 농단하도록 허용했고 최 씨와 공모하여 기업들로부터 돈을 강탈한 혐의를 받고 있다. 야후 뉴스는 최 씨와 몇몇 대통령 보좌관들은 이미 구속된 상태라고 타전했다. 기사는 또한 박근혜의 탄핵이 통과되기 위해서는 9명의 헌법재판소 재판관들 중 6명이 박근혜 탄핵을 지지해야 하나 9명 중 2명이 곧 임기가 끝나 퇴임한다고 전했다. 이에 1월 31일 퇴임을 하는 박한철 헌법재판소장은 3월 13일까지 재판 결과가 공표되어야 한다고 말하며 기사를 마무리했다. 다음은 뉴스프로가 번역한 야후 뉴스 전문이다. 탄핵된 박근혜 대통령의 친구로서 수감 중인 최순실(가운데)이 2017년 1월 25일 수요일 특검 사무실에 도착하며 소리를 지르고 있다. 특검은 내달 초 거대한 부패 스캔들과 관련해 박 대통령을 심문하고 청와대를 조사할 계획이다. SEOUL, South Korea (AP) — Prosecutors said Wednesday they plan to question impeached South Korean President Park Geun-hye and search her office by early next month over a huge corruption scandal involving Park and her longtime confidante. 한국 서울(AP) – 수요일 특검은 내달 초 거대한 부패 스캔들과 관련해 탄핵된 박 대통령을 심문하고 청와대를 조사할 계획이라고 말했다. 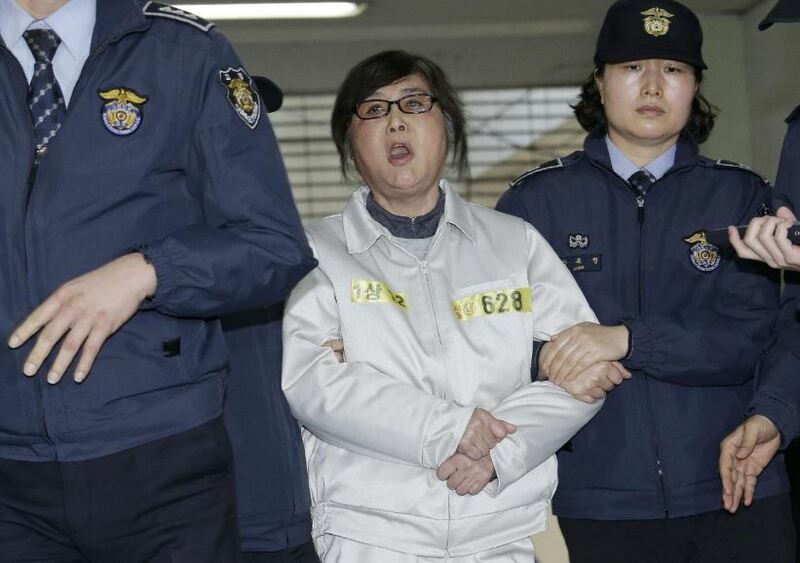 In an unusual moment earlier in the day, Park’s confidante, Choi Soon-sil, shouted out to reporters as she was brought to the prosecutors’ offices to be questioned. Choi called the investigation unfair and said she had been forced to confess untrue things about her relationship with Park. 금일 오전 흔치 않은 장면으로 박 대통령의 친구인 최순실은 조사를 받기 위해 검사실로 호송되며 기자들에게 소리를 질렀다. 최 씨는 수사가 불공정했으며 박 대통령과의 관계에 대해 사실이 아닌 것들을 고백하도록 강요받았다고 말했다. Lee Kyu-chul, a spokesman for the special prosecutors’ team, denied Choi’s accusations. 특검의 이규철 대변인은 최 씨의 비난을 부정했다. 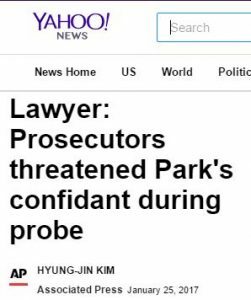 He said investigators are pushing to interview Park and search her office by early February. 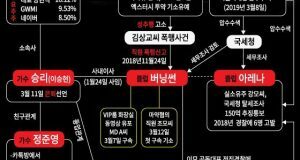 이규철 대변인은 검찰 수사관들이 2월 초 박 대통령에 대한 신문과 청와대 조사를 추진하고 있다고 말했다. 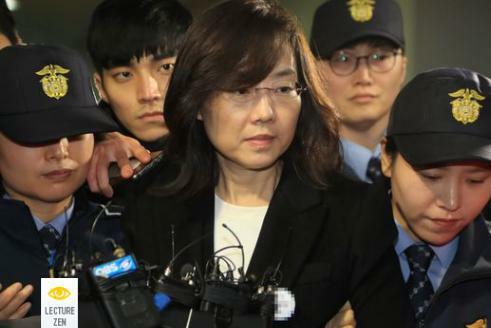 Park, who has been stripped of power but not removed from office, cannot be forced to testify at the Constitutional Court holding her impeachment trial. 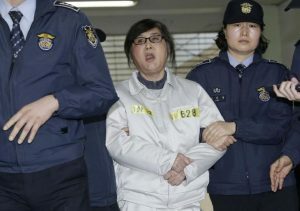 But she has said she’s willing to undergo questioning by the special prosecutors investigating the wide-ranging scandal. 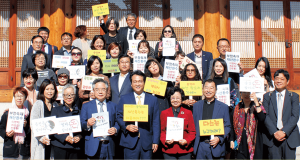 It’s not clear if her office will allow the search of the presidential Blue House. 권한을 박탈당했지만 직을 유지하고 있는 박 대통령은 자신에 대한 탄핵재판을 주관하고 있는 헌법재판소에서 증언하도록 강요받지 않는다. 그러나 박 대통령은 광범위한 스캔들을 수사하고 있는 특별 검사팀의 심문에 기꺼이 응하겠다고 말한 바 있다. 청와대가 관내 수사를 허용할지는 분명하지 않다. 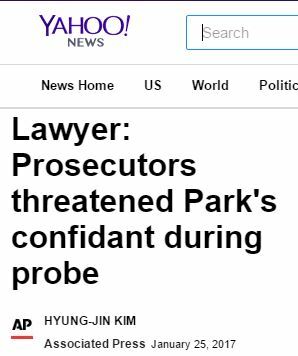 Park is accused of allowing Choi to meddle in state affairs and colluding with Choi to extort money from businesses. Choi and several presidential aides have been arrested. 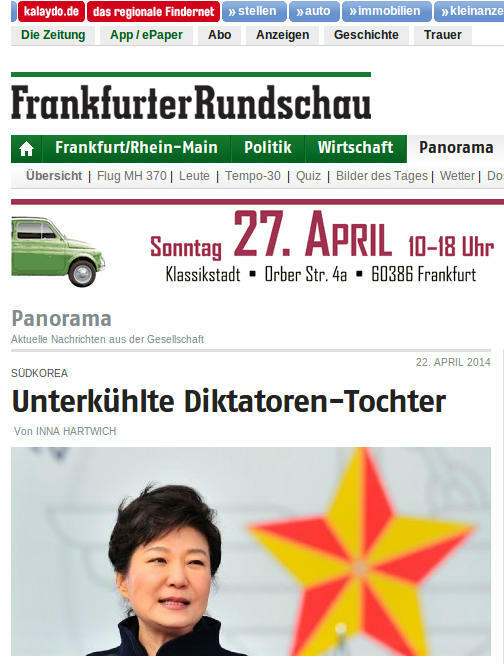 박근혜는 최 씨가 국정에 개입하도록 허용했고 최 씨와 공모해 기업들로부터 돈을 강탈한 혐의로 기소되어 있다. 최 씨와 몇몇 대통령 보좌관들은 구속된 상태다. 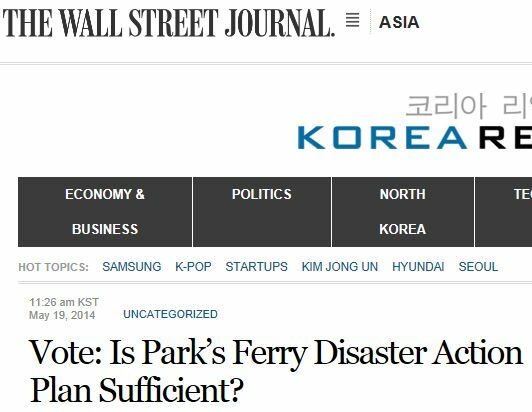 To remove Park from office permanently, at least six of the Constitutional Court’s nine justices must support her impeachment. Two of the nine justices will leave office in the coming weeks — one on Jan. 31 and the other on March 13 — when their terms of office end. But six “yes” votes are still required even if some seats are vacant. 영구히 박 대통령을 해임하기 위해서는 9명의 헌법재판소 재판관들 중 최소 6명이 박 대통령에 대한 탄핵을 지지해야 한다. 9명 중 2명이 다음 몇 주 사이(한 명은 1월 31일, 다른 한 명은 3월 13일)에 임기가 끝나 퇴임한다. 그러나 몇 석이 공석이 되어도 6명의 “찬성” 투표가 여전히 요구된다. 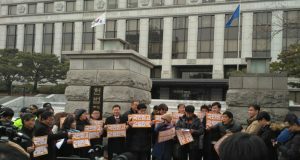 Court head Park Han-chul, one of the departing justices, said the court’s ruling should be issued by March 13. 곧 퇴임을 앞둔 박한철 헌법재판소장은 헌법재판소의 판결이 3월 13일까지는 공표되어야 한다고 말했다.